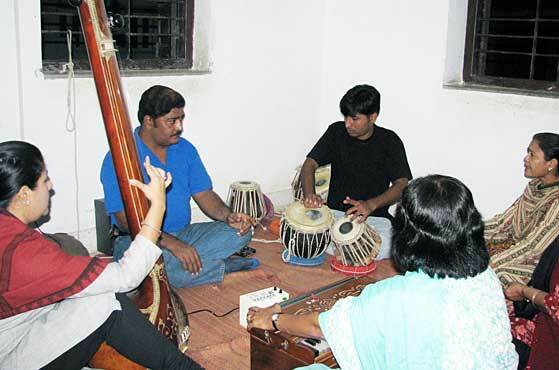 At the Saptak School of Music one learns not just the fundamentals of Hindustani Classical Music but also a feel for the finer aspects of appreciating subtle nuances, honing aesthetic sensibilities and learning how to be a performer and a listener. Starting out in 1981 with 77 learners, the school today has more than 450 learners on its rolls.. In the fledgling years when Saptak was looking for premises to start the classes, it was Shri Himmatbhai Kapasi, Managing Trustee of Vidyanagar High School, (Usmanpura Ahmedabad), who readily offered the school's premises for Saptak's classes. The tradition continues even today. At 6 pm every evening, the school is filled with the strains of the sitar, sarangi, violin and flute, the resonating beats of the tabla and pakhawaj and swaras reverberating in the air. 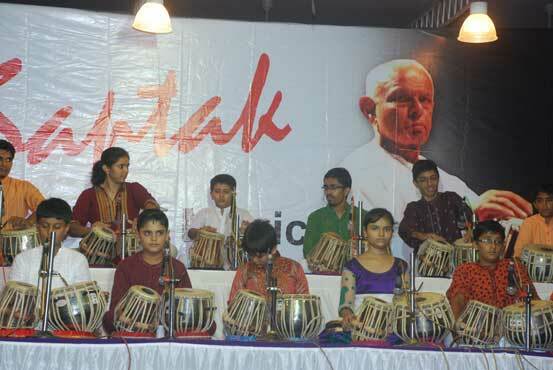 There are several aspects that distinguish Saptak as a school of music. Learning music here is not a time-bound, exam or syllabi oriented study. 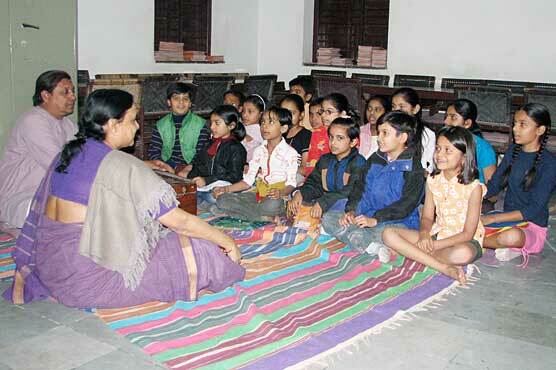 While the starting age is eight years, there is no upper age limit at the school. The teachers are performers themselves who initiate and hone the student's skills in the guru shishya parampara tradition. Active learning also extends to observing maestroes perform and interacting with them to enrich one's knowledge of music. Talented students are encouraged to perform before a small selected group of music lovers and connoisseurs at Saptak Archives. From here on, the students who show promise move on to a bigger platform. A deep and abiding passion for music, the right temperament for learning, an ever widening sphere of knowledge and an exposure to best performing talents in the field of Indian classical music - this is what a student gains at the Saptak school of music. The Saptak School of Music has two terms in a year : Summer to Diwali and Diwali to Summer. Classes are held three days in a week in 2 different batches. (Monday, Wednesday and Friday or Tuesday, Thursday, Saturday). There are three sessions each day from 6.00 p.m. to 8.00 p.m., each session extending for 45 minutes. The term fee is Rs.3150/- (Cheque or Cash per term) and Rs.3100/- (Online per term) for the academic year and Music Library Fee Rs.400/- with an additional Rs. 200 charged in case of a new admission. 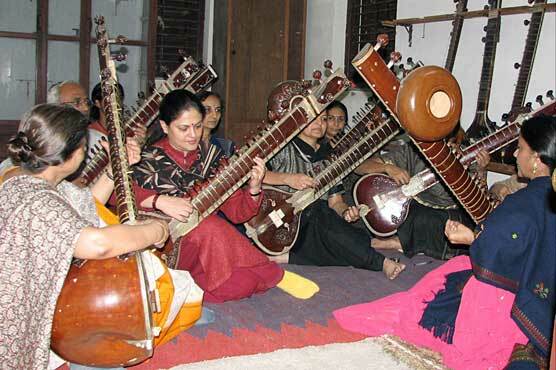 Students can learn Classical Vocal, Tabla, Pakhawaj, Sitar, Flute, Violin, Harmonium and other instruments.